This place was absolutely amazing! The staff were so welcoming and the hostel offers such a social environment. Everything about the space and the experience was great from the rooms to the free massages! Additionally, we absolutely loved the tour company that the hostel uses for the volcano hike. Overall, we had such an amazing time and would recommend this place to anyone visiting Antigua! Very helpful and friendly staff. A little bit of a walk to the center of town but very easy to get around. Clean with hot showers. Social atmosphere but definitely not a party hostel. 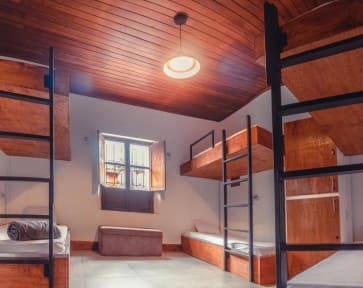 Only negative is I’m not a fan of three high bunk beds. Everything about this hostel is perfect. Great staff, super clean - great bar but nice places to sit and relax. Yet to find another hostel with free hot tub & massages. Would 100% recommend. The hostel is very well located, clean and has a great atmosphere. 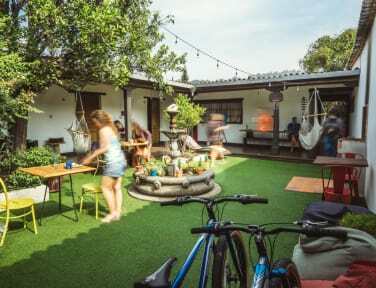 You get to meet a lot of other travelers without it being a party hostel. The staff was super helpful and you can book shuttles to other cities and activities through the hostel very easily. Loved the free massages and hot tub! Great hostel as a base in Antigua. The staff were really helpful and went out of their way to explain things and help as much as they could especially Dave and Meli (probably spelt wrong!). Facilities were great and especially liked the free massages and hot tub. We also stayed in their sister hostel Somos and it was excellent too. It’s a little bit of a walk to the main square but Antigua isn’t that big. The staff was super friendly and the people who stayed at the hostel had great vibes. Highly recommend. MY FAVORITE HOSTEL! Great wifi, great lounge courtyard area, hot tub, amazing staff that helped me with everything! I stayed in the private room so I can only speak to that but it was perfect for me, I did the volcano hike the night before so I wanted find a hostel I could actually get some sleep at. The street outside the window is a bit loud at night and it's stuffy if you close the window, that was my only critique, otherwise great hostel! Very nice rooms and comfortable beds. A friendly atmosphere with a good relaxed comunal area with very friendly staff. Matiox get the balance perfectly right. Enough of an atmosphere to have a good time and meet new people. But not a loud party hostel. The staff are great, it's very clean, really well equipped kitchen and of course the hot tub is great. Only downsides are that the basic dorm is a bit loud because it backs onto a busy road and the location isn't very central. Matiox is mostly for young folks who like hot tubs, movies, and beer. Really helpful staff/information and connection to activities in Antigua and neighboring attractions, including some discounts.